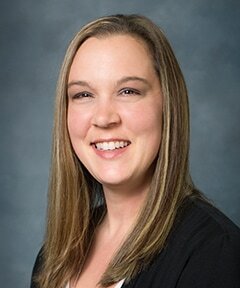 Jessica Nelson, Certified Nurse Practitioner (CNP), has joined the Winona Health Pediatric and Adolescent Medicine team. Nelson earned her Master of Science – Family Nurse Practitioner degree from Walden University, Baltimore, Maryland, and is certified by the American Association of Nurse Practitioners. Prior to becoming certificated as a Family Nurse Practitioner, she cared for patients as a registered nurse in the Family Birth Center for nearly 10 years and then for patients in the Dialysis department. Nelson and her husband have four children and live in Rollingstone. In her free time, she enjoys spending family time on the river or just being outdoors fishing, hunting or hiking. In addition, Nelson volunteers as the director of the Rollingstone First Responders and president of the Rollingstone chapter of the Jaycees. Nelson joins pediatricians Sarah Lallaman and Kelli Ostermann. Autumn Cole, CNP, and Laura Dubis, PA-C, in Winona Health’s Pediatric and Adolescent Medicine department. To schedule an appointment, call 507.457.7607. Winona Health has a provider designated for same-day appointments for children who are sick. For information about healthcare providers at Winona Health, visit winonahealth.org and click Find a Provider.